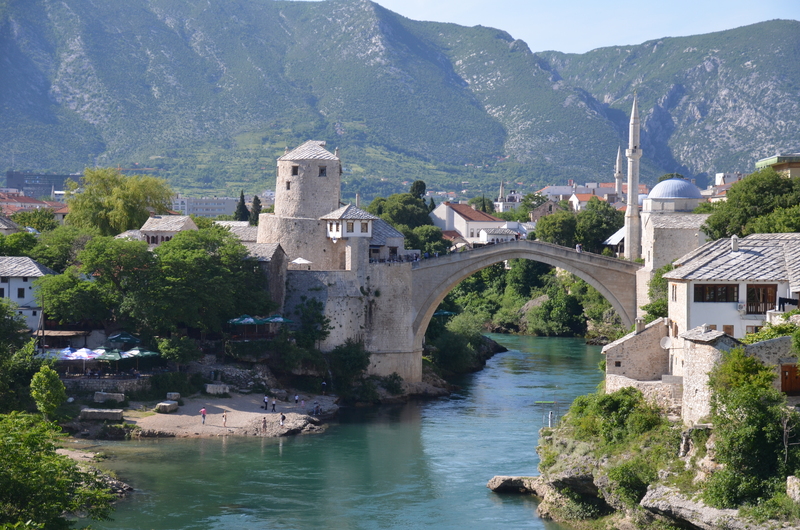 June and I visited Serbia, Kosovo, Macedonia, Albania, Montenegro, Bosnia-Herzegovina, Republic of Sprska, Croatia, Slovenia with Bestway Tours & Safaris, and following are our observations, things we learned saw and enjoyed. • Seeing that restaurants in Serbia are either smoking restaurants or non-smoking restaurants and that the restaurants with the most customers are the smoking restaurants. • Learning which restaurants are smoking or non-smoking before entering because each one is labeled outside with the international cigarette sign of a cigarette with a slash through it or no slash. • Getting a plastic fork on the Lufthansa flight to Belgrade that had a hinge in the handle making it half the normal length and opening like a pocket knife. • Pulling into Belgrade and seeing a huge explosion of white smoke in the area of our hotel, only to find out it was 2 blocks away from our hotel, and causing McDonalds next door to it to be closed for the day. 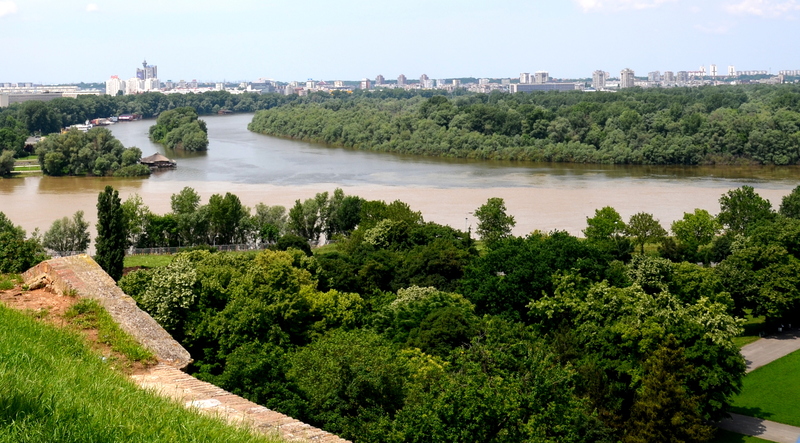 • Seeing how the Danube and Sava Rivers come together and flow as one at the Belgrade Fortress. • Learning the reason the name “Yugoslavia” was given to the land of the Serbs was because “Yugo” means south in Serbian and Yugoslavia was the southern countries of the Slavs. • Learning that Belgrade is “white city” in the Serbian language because the original settlers came and saw the white wall surrounding the ancient city. • Learning that our Hotel Moskva was built in the early 20th century and was the first luxury hotel in Belgrade. Today, it is listed as a 4-star hotel, has been remodeled and modernized, and is one of our favorites. 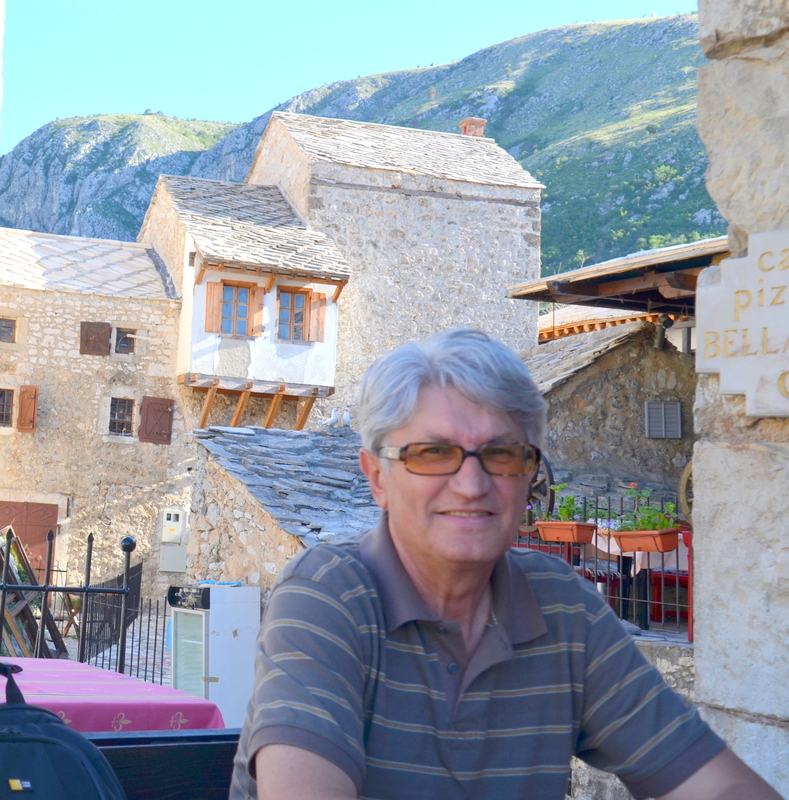 • Knowing that our guide, Vojislav Tomic (Boys slav Tom ich) is a professor of philosophy at the University of Belgrade, and he also works as a private guide and that his daughter lives in the USA. • Seeing that part of the moat of the Belgrade Fortress is now being used for tennis courts. Learning that Blue Jeans are produced in Serbia from cotton imported from Egypt and Turkey, and shoes are produced from Serbian leather. Meat, Flowers, Light, Weddings, Cards, Potatoes, Mt. • Learning that the main dish in Serbia is meat, meat, meat. • Talking English with almost all Serbians. 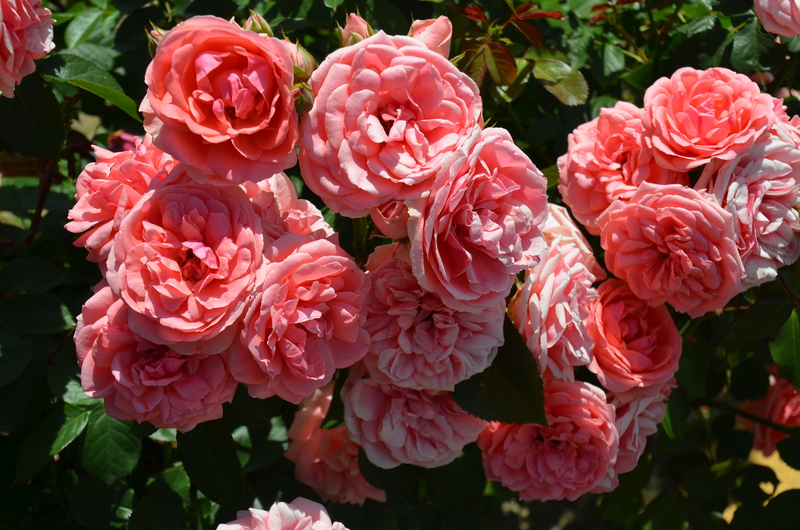 • Seeing beautiful flowers everywhere. • Experiencing the powers of what it must have been like to be a goddess walking down the dark hall of our Belgrade hotel and demanding that we have light and the lights magically illuminate our way with the wave of our arms. • Peeking into a wedding reception in our hotel and seeing that the wedding gift for each guest was a cup and saucer. 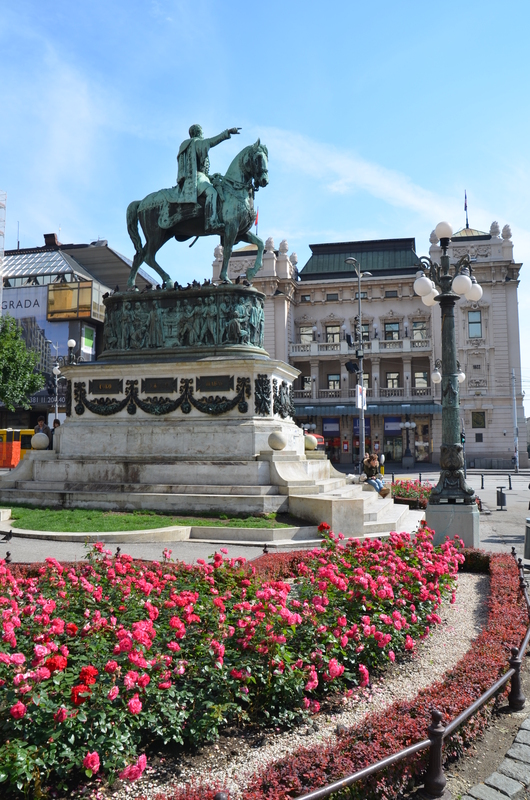 • Seeing a group of people gathered by the fountain sculpture all the time in front of our Hotel Moskva in Belgrade and seeing them with lottery-like cards, only to find out they were trading sports cards. 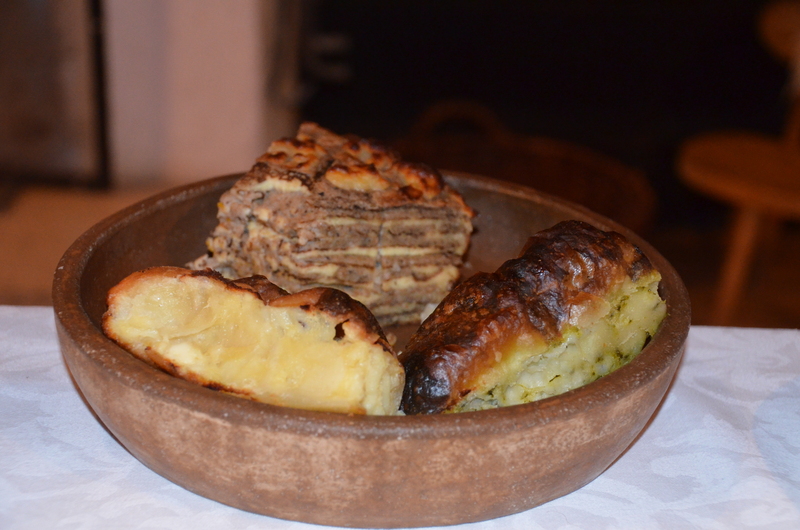 • Eating bared potatoes which are cooked on the grill in a clay pot and learning the reason they are called bared is because they were peeled. • Learning that all meats in Serbia are barbecued or grilled. 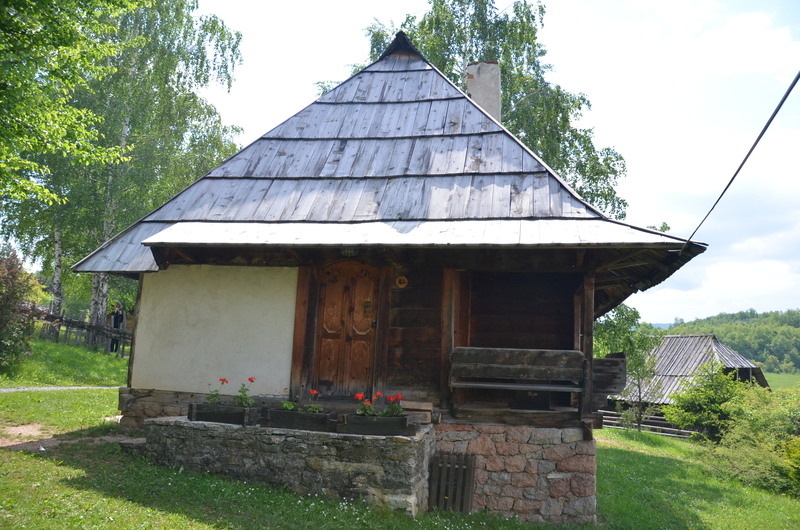 • Visiting the old 18th century Serbian village on Mt. Zlatibor next to our cabin #43 which resembled the old village with modern amenities inside. • Attending Sunday Eastern Orthodox service at Saborna Cathedral in Belgrade and absorbing the beautiful liturgy while standing because an Orthodox Cathedral has no chairs. • Seeing Belgrade’s St. Sava Cathedral which has been under construction for 70 years. • Learning that the blueberry vines growing in Serbia look just like a grape vineyard. 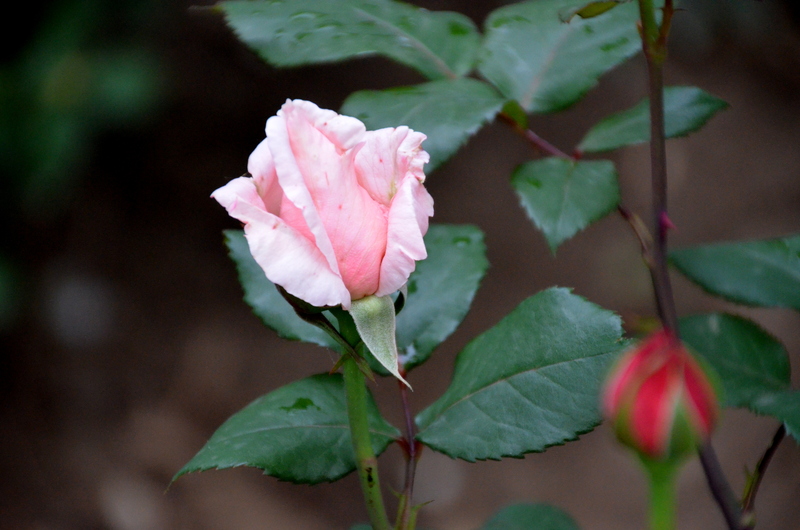 • Seeing red roses in bloom all over Belgrade. • Learning that orthodox means universal. • Seeing the beautiful mountains and countryside on the way to Mt. Zlatibor. • Seeing the Drina River lined with boats, and floating houses, boats, marinas and restaurants. • Experiencing heaven with Sweet Pie made of walnuts and apples, and crepes made with local jam for dessert at our Mt. Zlatibor cabin lodge. • Learning that Serbian music is all upbeat and about love and love lost. 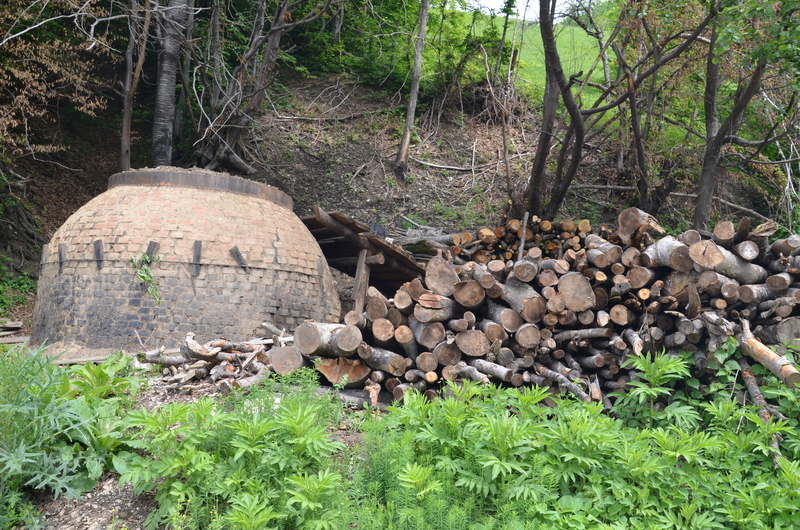 • Seeing huge pile after pile of wooden logs waiting to be made into paper in forested Serbia. • Learning that Wedding Sauerkraut is cabbage and meat. • Learning that all dishes are cooked in pottery and are they delicious! • Going from a 4-star a hotel in Belgrade to a no-star cabin lodge in Mt. Zlatibor. Priceless. • Learning that if the first born child in a family is a son and the second one a daughter, this is considered to be a “royal family”. • Visiting 3 countries in 7 minutes when we went from Serbia to Bosnia-Herzegovina to the Republic 0f Srpska. • Learning that Serbia exports electricity, agricultural products and that nuclear power plants are forbidden. • Learning that Serbia has a low divorce rate and that the average age of the population is 41. • Seeing Durbin Wood near Mt. Zlatibor in Serbia, built as a wooden movie set by director Kustulica and now is a village. • Walking across the perfectly preserved pumice stone bridge finished by the Ottoman Empire in 1571, in Visegrad, Republic of Srpska. • Eating gelato while sitting in a restaurant on the fast-moving Drina River overlooking that stone bridge in Visegrad, Republic of Srpska. Wonderful. • Traveling 15 kilometers on the old and narrow gauge steam train, Sarganska Osmica, through Serbia and the Republic of Srpska. • Seeing that the smoking is heavy among the young and old in the 8 countries of the former Yugoslavia. • Experiencing waiters who do not take your plate until you have totally finished eating and are ready to have it removed from the table. Priceless. • Eating the delicious local foods and not really knowing exactly what they are. Fun. • Going through 22 tunnels on the steam train ride to the Republic of Srpska with a train full of high school students drinking beer, smoking, and singing. Interesting. • Learning the purpose of the Visegrad Ottoman stone bridge was to get to the other side and to collect taxes. 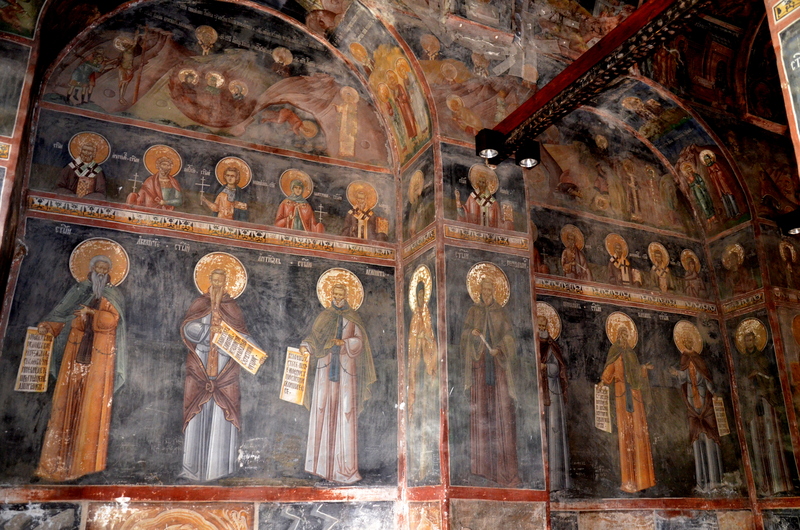 • Learning that the frescoes in the Monastery Studenica, a UNESCO world Heritage site, are considered the crowning achievement of the medieval culture and art in Serbia. 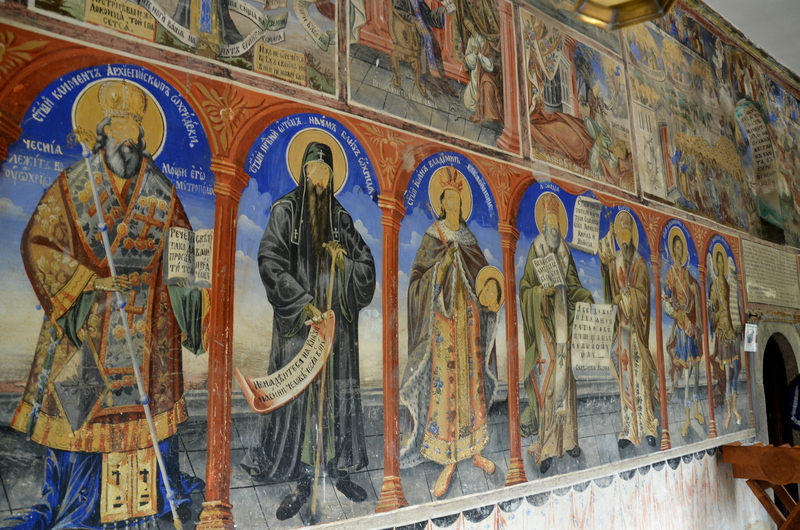 • Seeing the monastic complex of Eastern Orthodox Monastery Studenica consisting of 3 churches-the Church of the Virgin, The King’s Church, and the Church of St. Nicholas, all full of priceless frescoes that tell the story of the Bible. • Seeing the Monastery Sopocani, a UNESCO World Heritage Site, also full of priceless frescoes that showed the people the Bible in pictures. The paintings are known to be among the most magnificent in European medieval art. • Learning that the frescoes in Sopocani Monastery were made in 3 layers-sand, lime and powered sand. Then the picture was drawn on with bone-like pencil and students would add the color. • Learning that the Eastern Orthodox Monastery Sopocani was an endowment of King Uros, of the Nemanjic Royal Family of 12-15th century, and he is buried in the Monastery. • Seeing how the painter of the Last Supper fresco in the Monastery Studencia Church put a fork and knife and blond hair in the fresco showing he was thinking of the way they ate and looked in the 12-13th century, not how it was in the time of Jesus. • Learning that the Serbian Orthodox tradition is to wear the wedding ring on the fourth finger of the RIGHT hand. • Seeing igloo-like mud and brick handmade domes, called mala kapela, in the Serbian forest where villagers make their charcoal. Interesting. • Seeing the frescoes in the Eastern Orthodox Monastery Gracanica covered with holes like polka dots due to damage during the Turk Ottoman Empire. • Eating lunch while traveling in the van making hair-pin turns one after the other, slinging us right to left and left to right constantly through the mountains. Unbelievable. • Parking under the “shadow” of a tree at Monastery Studencia and learning that where the monks lived in their private quarters are called cells. • Waiting for the heavy rain shower to stop so we could enter the Monastery Studencia, only to see a white long bearded monk dressed all in black exit the monastery and walk by us. Then we learned he was the head priest. Priceless. 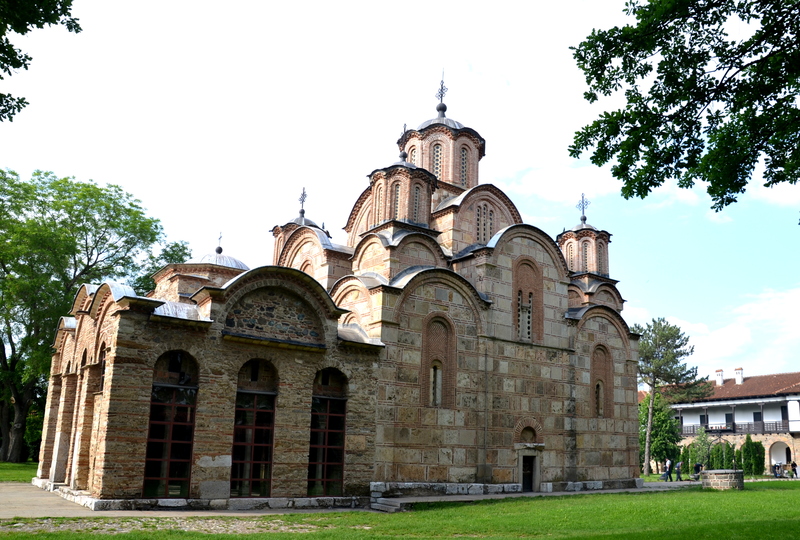 • Seeing many monasteries in southern mountains of Serbia that were established in the 9th, 10th and 11th centuries. • Leaving Serbia through customs and being cleared to enter Serbian Kosovo. • Entering Serbian Kosovo through customs and being cleared to pass into Kosovo. • Going through NATO and UN passport checks before entering Monasteries Studenica and Sopocani in Kosovo. • Leaving Kosovo through customs and being cleared to leave. 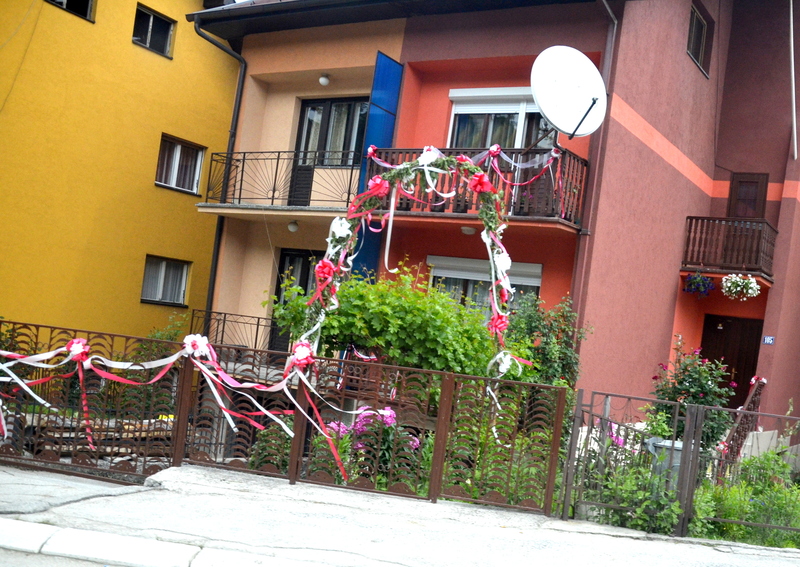 • Seeing homes all over the ex-Yugoslavia countries with decorated gates, fences, entrances, cars and everything that could be decorated with ribbons only to learn that it all means a couple is newlywed. • Having to present our passports and being checked 9 times in one day from Serbia to Macedonia through Kosovo. Unbelievable. 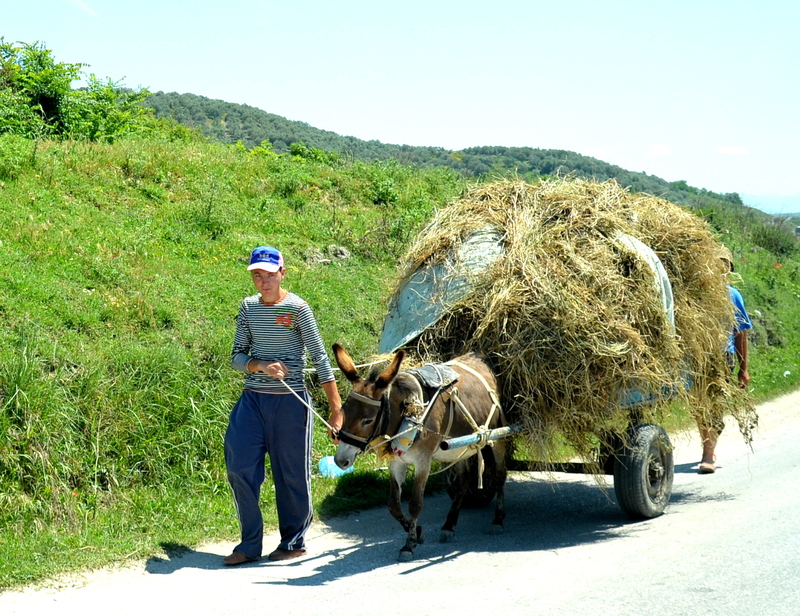 • Seeing no street or directional signs anywhere in the ex-Yugoslavia countries and having to stop and ask how to get to the next destination. 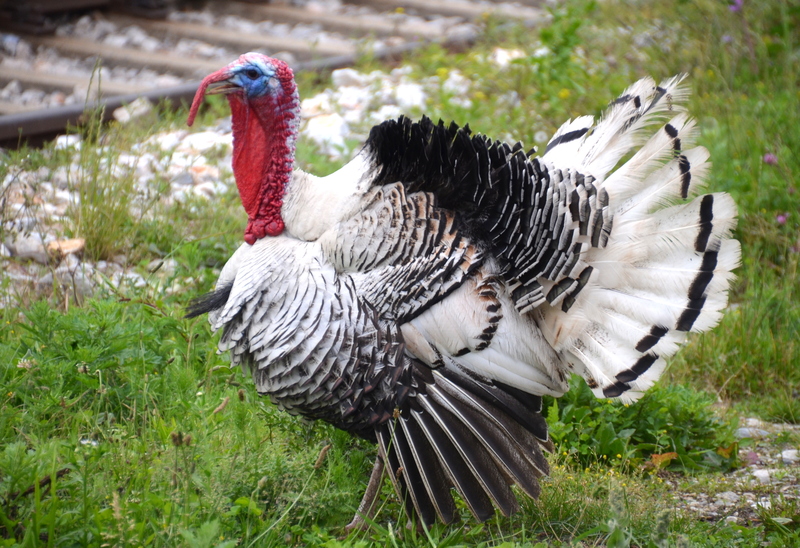 • Having coffee in a pizza/petrol gas station and seeing a male turkey doing a full mating plumage dance, a turkey hen with 9 teenager babies, and a mother goose with 13 babies, all in Pec, Kosovo. Amazing. 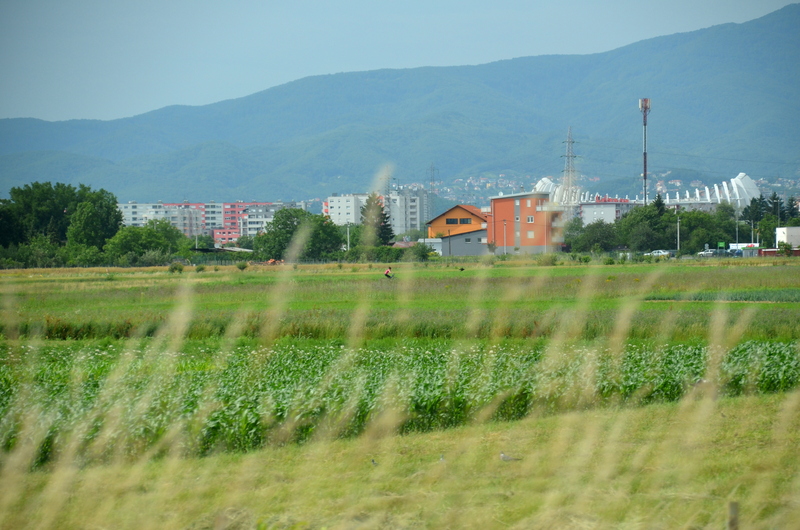 • Traveling through Pristina, Kosovo where UN presence has been for 12 years. 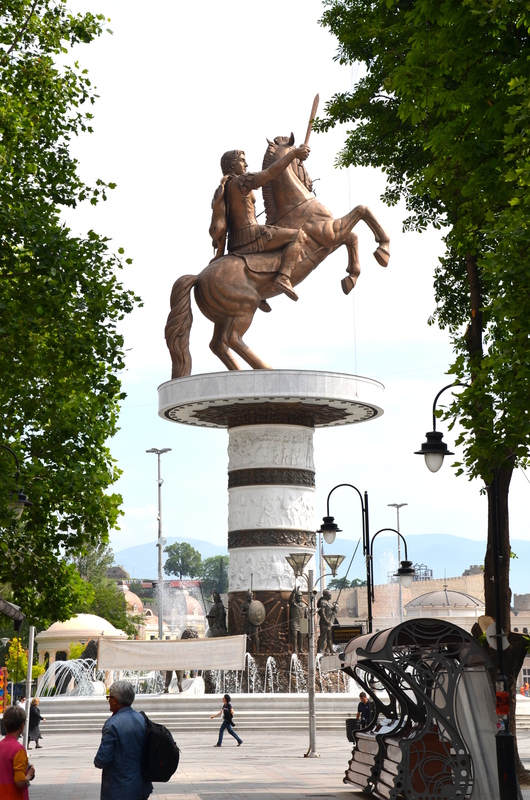 • Seeing a 20-foot statue of former US President Bill Clinton pointing with his arm in the main square of Pristina, Kosovo and a Hillary clothing store nearby. Drinking the red wine purchased from the Sopocani Monastery in Kosovo was so delicious, Tomic, June and I all finished the bottle with one dinner. Enjoyable. • Learning that the northern part of Kosovo is 95% Serbian and that Serbia does not recognize Kosovo as an independent country. 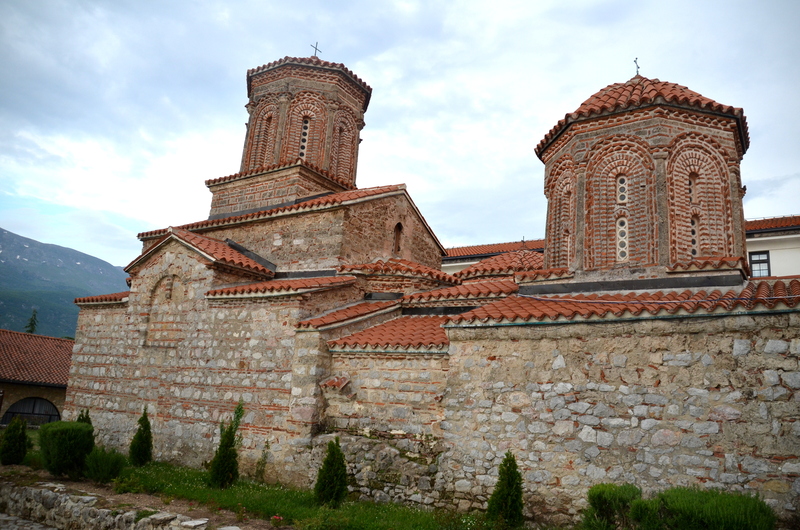 • Visiting Grancanica Monastery in Kosovo, a UNESCO World Heritage site and a Serbian style Byzantine church. • Seeing the main bridge near the town of Mitrovica, Kosovo in Rudare Village blocked by huge pile of dirt and Hungary’s KFOR and being told to we “couldn’t cross the bridge so move on, leave”. Sitting in a small old red car, the soldiers kept telling us to leave and charged us in our van with their car. Clashes in the town of Zvecan nearby occurred soon thereafter. • Seeing beautiful new homes and office buildings empty in southern Serbia and Kosovo. 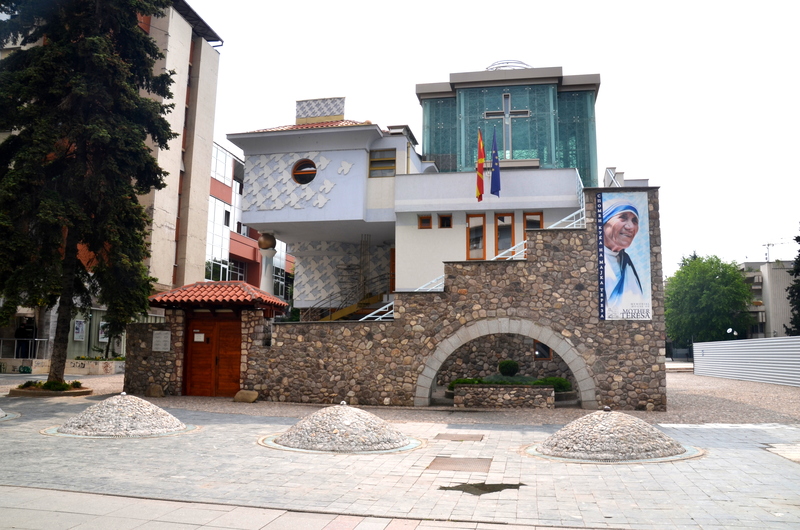 • Learning that Mother Theresa was born in Skopje, Macedonia. • Walking at night to the main square in Skopje, Macedonia and watching the colors change on the beautiful water fountain with a huge marble column and Alexander the Great on his horse at the top. • June asking the teacher of a group of singing small children if she could take their photo only to get a surprise performance by the children singing a song in English for us and the crowd that instantly appeared. Priceless. 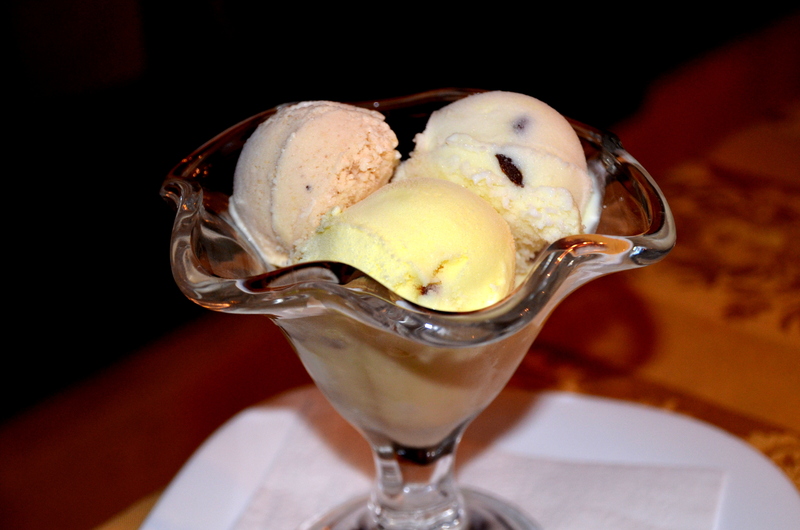 • Having gelato in Mavrovo National Park in Macedonia in a log cabin restaurant. • Visiting the St, John the Baptist Monastery in Bigorski, Macedonia located on the side of a mountain. • Seeing the most impressive iconostasis carved in wood in the St. John the Baptist Monastery telling the story of the Bible that took 5 years to carve. It is the most impressive in all of southern Europe. Priceless. • Learning that an iconostasis is a wall of icons and paintings separating the nave and sanctuary of a church. • Seeing the bone relics of the 9 saints in St. John the Baptist Monastery. 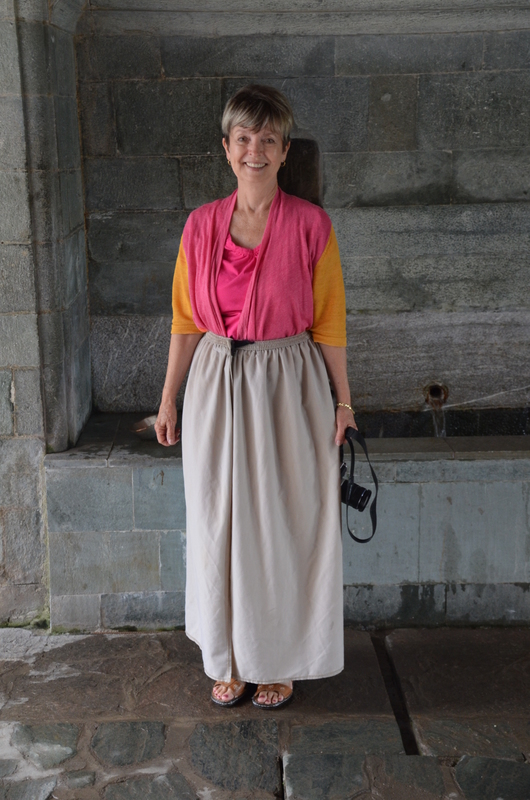 • Seeing 75 high school students leaving St. John the Baptist Monastery in shorts, tight slacks, and low-cut tops, and commenting on the appropriate dress in a church only to enter the monastery and be given a long skirt to cover our appropriate long pants. 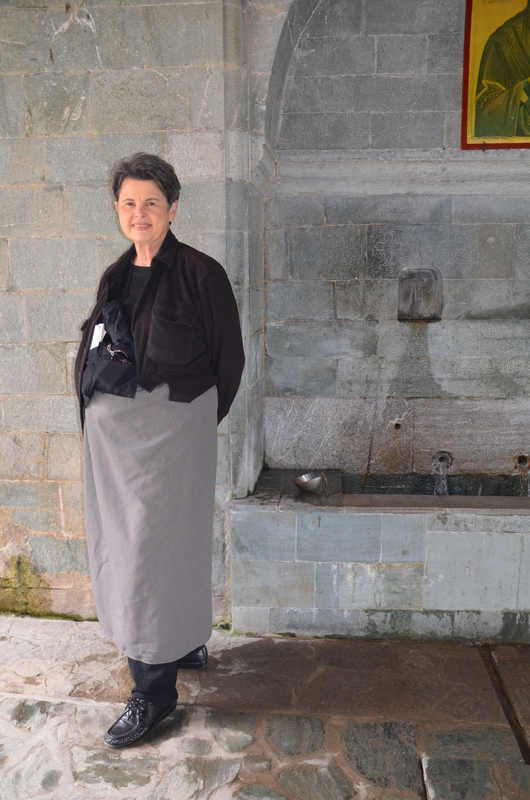 • Visiting St. Naum Monastery near Ohrid, Macedonia where the art of Cyrillic writing was taught. • Seeing the 2 B.C. Roman and Byzantine Fortress that was destroyed in the 10th century Tsar Smuili Fortress by Bulgaria and then rebuilt by Bulgaria using the same stone in Ohrid, Macedonia. 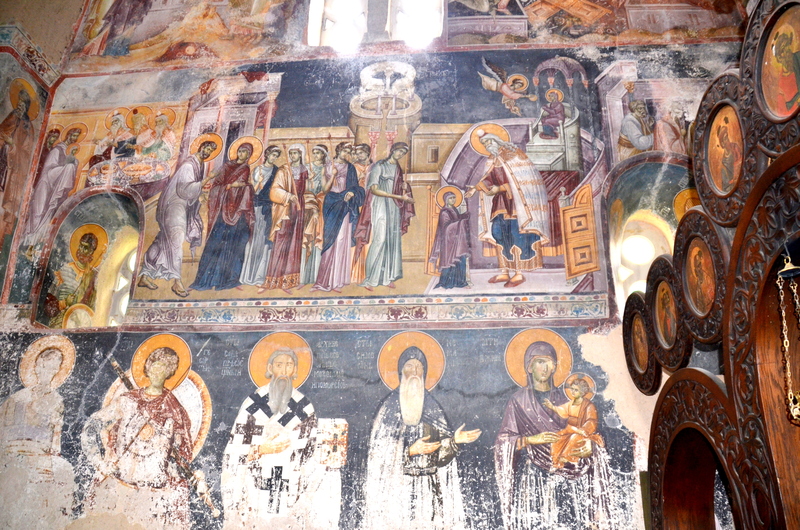 • Being given a private tour by Jana Poposka through the Mother of God Peribleptos St. Clement Church in Ohrid, Macedonia to see the frescoes only to learn that she wrote THE book about the church. • Seeing a fresco of St. Peter in the St. Clement Church (13th century in Ohrid Macedonia) with 2 keys in his left hand, one to Heaven and one to Hell- and another fresco of St. Peter with 3 keys in his left hand to Heaven, Hell and Purgatory. 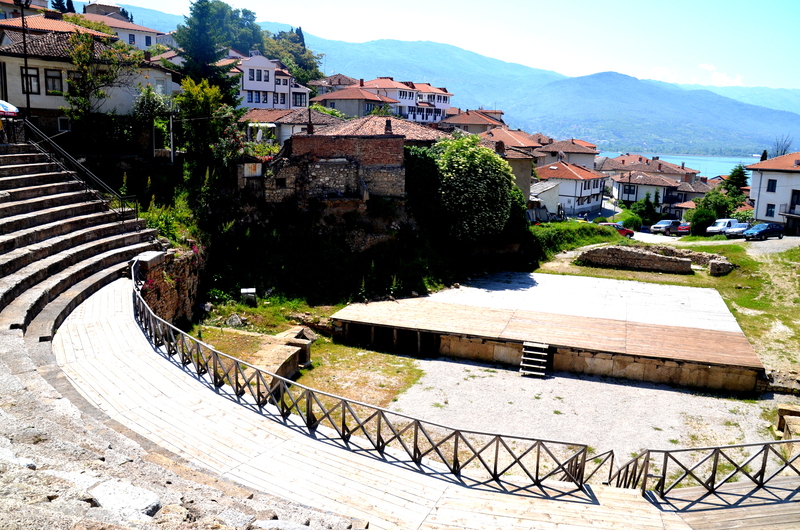 • Seeing the Greek Roman Theatre in Ohrid, Macedonia, built in the 3rd century and being used currently for performances in the summer. • Seeing St. Sophia Church in Ohrid, Macedonia, built in the Byzantine 11th century. • Learning that Ohrid, Macedonia is known as the city of 365 churches, and seeing many of them. • Seeing St. Panteleimon Church in Ohrid, Macedonia, built in the 9th century. 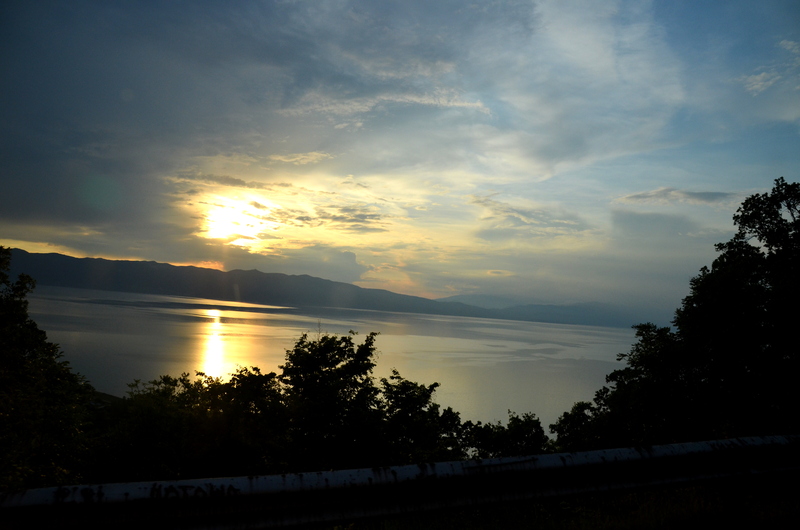 • Learning that Ohrid, Macedonia was called Lychnidos, the City of Lights, in ancient times. • Looking and looking all over for the hotel key card only to find it in the control slot that operates the room’s electricity. • Wondering why the hairdryer didn’t work, only to realize that the room key was not in the electricity slot, therefore no electricity in the room. • Getting a bottle of wine at the Decani Monastery to drink with meals and to learn that it was super strong and only one glass would make you know it. • Seeing a home with a satellite dish on one side of the road only to see 2 mules plowing the field on the other side of the road, therefore blending medieval and modern. • Stopping in Albania for tea and gelato in a restaurant in Elbasan Castle (Albania) , with an awesome view of the old fortress and enjoying its new use. • Having Denis, another guide, in Albania to show us his country. 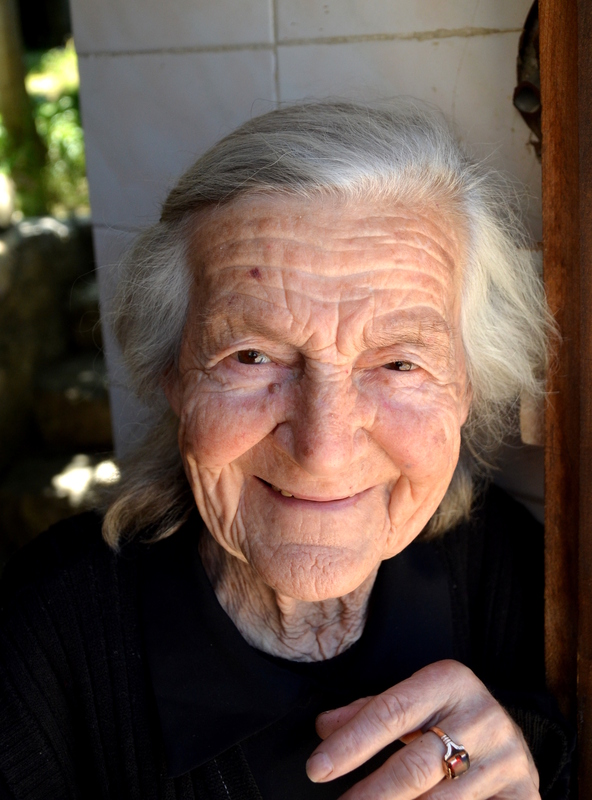 • Getting handmade dolls from Macedonia and, in Albania, from a woodcarver whose wife had made them from scratch. Wonderful. • Seeing paper being made from wood to paper in Ohrid, Macedonia and hearing Dolly Parton’s singing “Nine to Five” on the sound system. • Seeing almost everyone driving a Mercedes Benz in Albania. • Getting locked in the van accidently by Tomic, our tour guide, getting a map of Macedonia, making it necessary for June to crawl over the middle and front seats, cut the van off, pull out the key and push the “Open” button. Freedom. • Seeing a bird swoop down and steal a nut from the vendor selling all kinds of nuts as we walked around the Lake in Ohrid, Macedonia. • Learning that in 1991 there were 200,000 people in Tirana, Albania and 11 years later there were 800,000 because of immigrants from Kosovo and Serbia. • Learning after the year 2000, buildings were painted multi-colors in the older part of Tirana, Albania. • Learning that 20-30% unemployment exists in some of the ex-Yugoslavia countries. 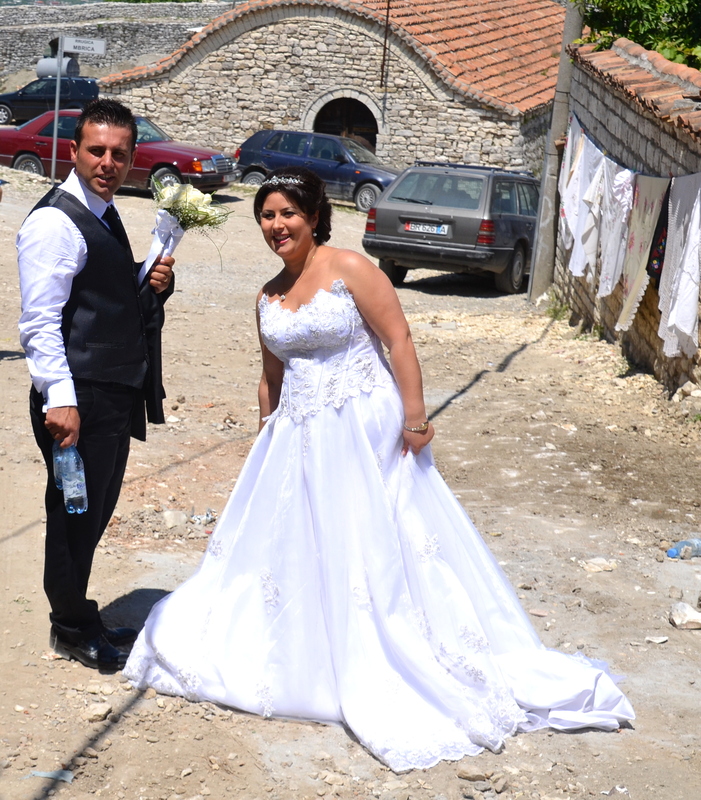 • Learning that a wedding in Albania costs about $10,000 US or 10 million leke. 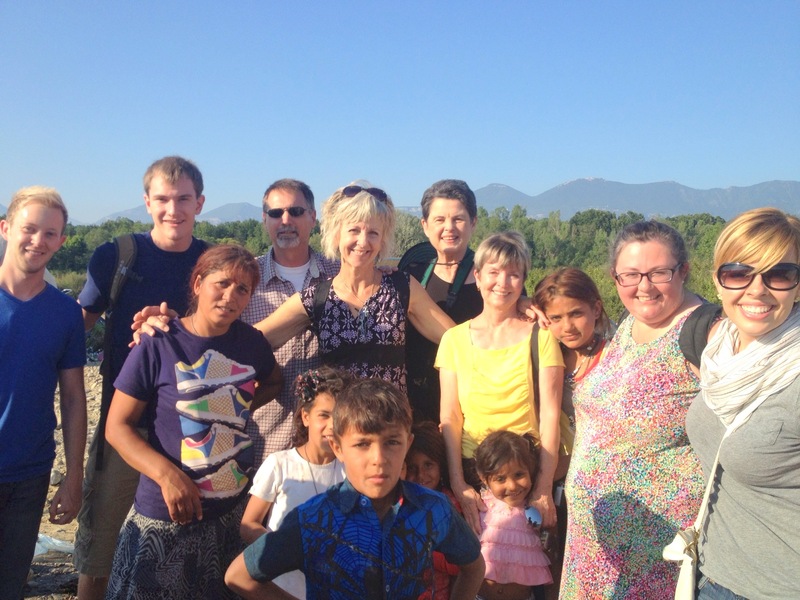 • Meeting Melody and Seth, June’s friends from the USA, who were a mission trip to Tirana, Albania, because they previously fell in love with the people and wanted to teach them about Jesus. • Having a traditional Albanian dinner with Melody and Seth at their favorite restaurant and then going to Sky Tower for coffee, gelato and fireworks on the top floor as it rotated 360 degrees, giving a fabulous view of the beautiful city of Tirana. 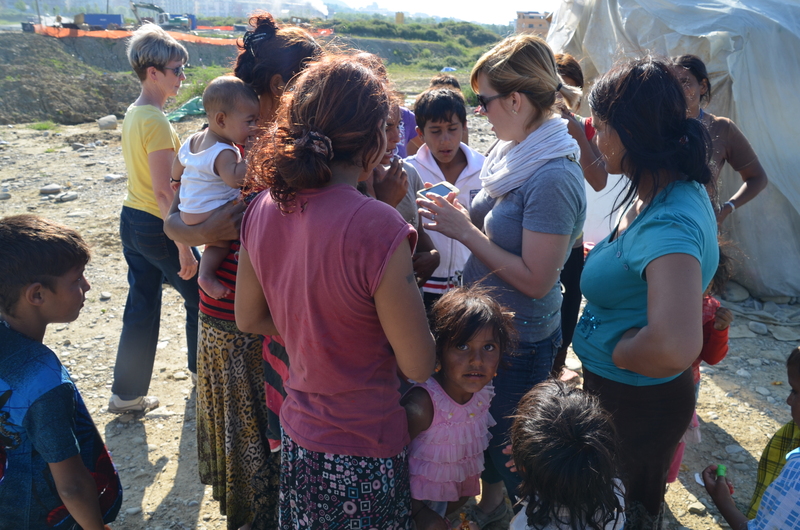 • Having Melody and Seth take us to meet with 2 Roma families in Tirana, Albania in their tent homes, seeing the difficult conditions in which they live, giving candy to and loving the children, and showing that we care for them. Priceless. 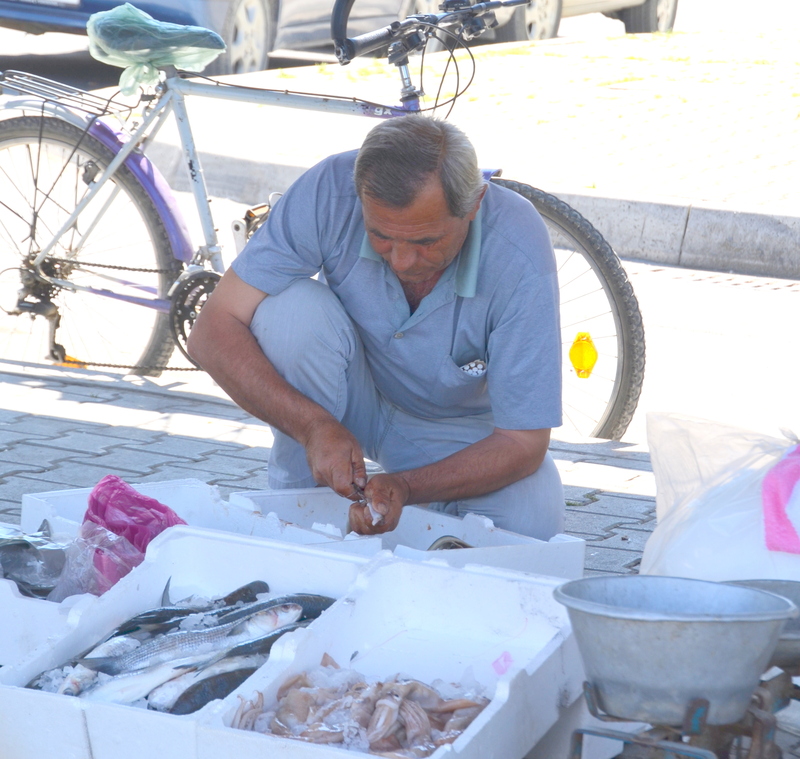 • Seeing a man in Berat, Albania sitting on the street cleaning his fish to sell only to find out he was cleaning snakes! • Learning that Albania has no copyright laws to protect companies; therefore no companies want to do business there. • Learning Albania has so many nice abandoned buildings because the builder ran out of money and left it. • Learning that Albania has many underground springs and therefore has never run out of water. • Visiting the 10th century Assumption of the Virgin Mary Church in Berat, Albania, medieval village, a UNESCO World heritage Site, which is now a museum. 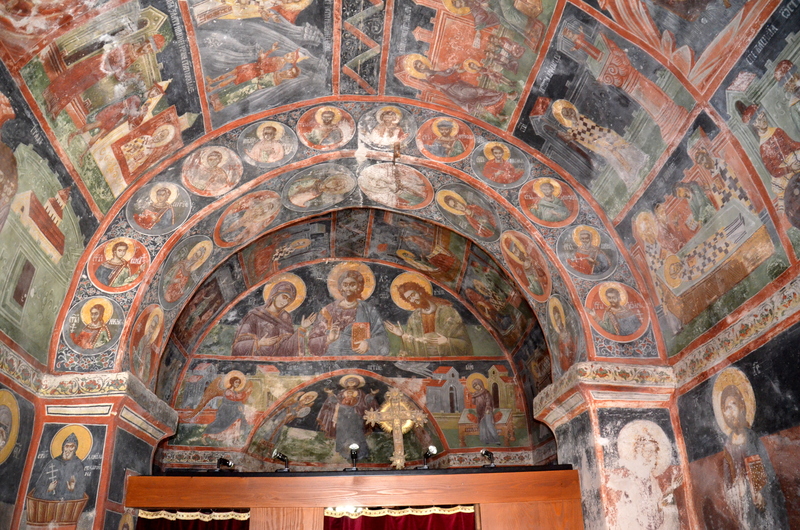 • Learning in 1967 that communists destroyed the Assumption of the Virgin Mary Church in Berat and whitewashed the priceless frescos to get rid of them because they do not believe in allowing Christian images in houses of worship. 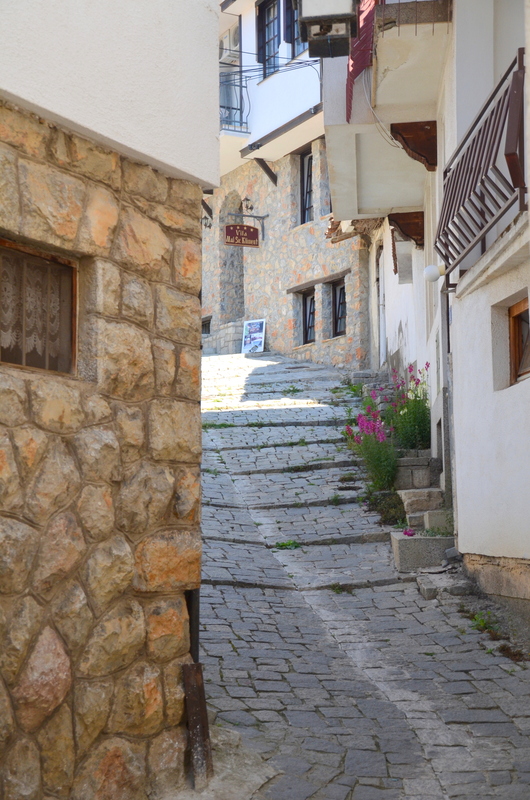 • Learning in Berat 42 churches originally existed and now only 17 remain. • See the 3 icons that Onufri the painter originally made in the 16th century-Jesus, Mary and John the Baptist. • Seeing icons covered in silver so that the worshippers could touch and kiss and not harm the icon painting leaving the face and arm uncovered. • Seeing the painted icon with only the face and arm left uncovered by silver. 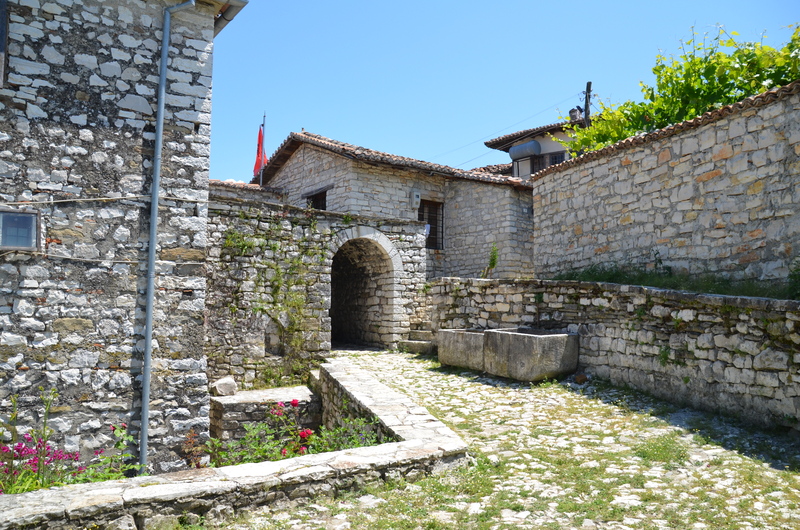 • Observing the renovating and repairing work in progress in the ancient city of Berat, Albania, with the help from UNESCO and the European Union. 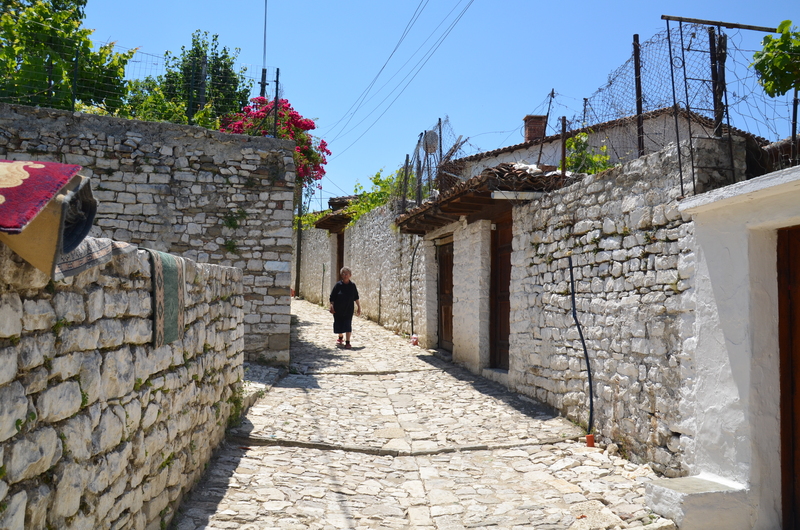 • Learning that all houses in the medieval city of Berat, Albania, are occupied. • Seeing car wash after car wash and learning that Albania has a lot of water, providing employment for some of the previously unemployed. • Doing hairpin turns regularly as we drive through the mountains of Serbia, Albania, Macedonia and Croatia. • Learning that Albania has 500,000 concrete bunkers Communist leader Hodja because he had a phobia against all countries. We saw some of the bunkers. • Learning Hodja told his people they could trust him and the bunkers were safe. He invited them into the bunkers and then sealed them with concrete, where they died. • Laughing out loud when we learned that the word “shitet” written all around Tirana, Albania meant “For Sale”. • Seeing the George W. Bush sculpture in the main square and riding on the George W. Bush Blvd. in Kruja, Albania. The Albanian people love him because he visited Albania and showed his support of them. • Getting stopped by the police after visiting the beautifully designed Museum of Scanderbeg in Kruja, Albania, for driving the wrong way on a one-way street. The Albanian guide, Denis, asked forgiveness of the police because he told the driver, Tomic, to drive wrong. Tomic was then told to continue driving the wrong way to the end of the street by the police. 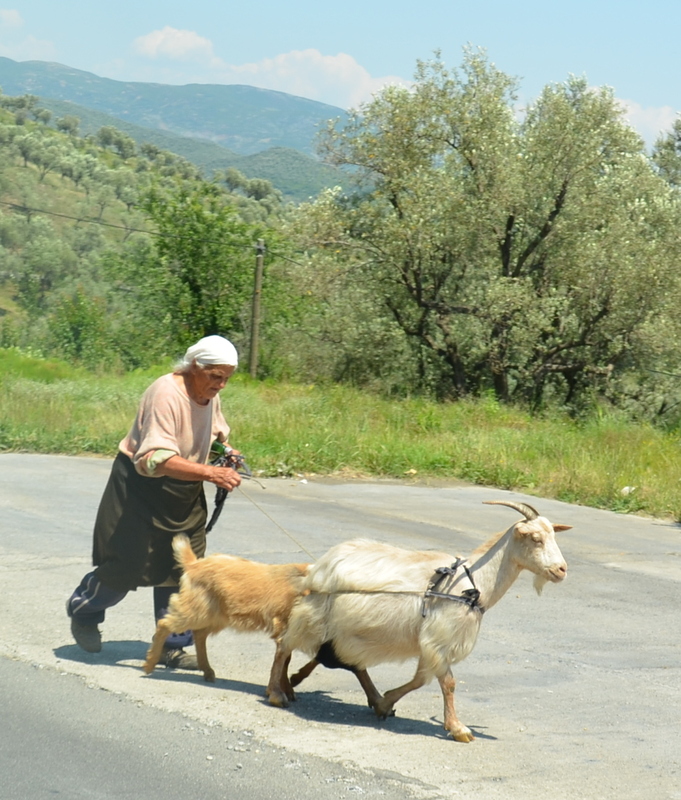 • Having to stop and ask directions for almost every destination because no traffic signs exist in Albania. • Enjoying gelato in every country along the way. Delicious. • Learning Montenegro is the second smallest country in the European Union. 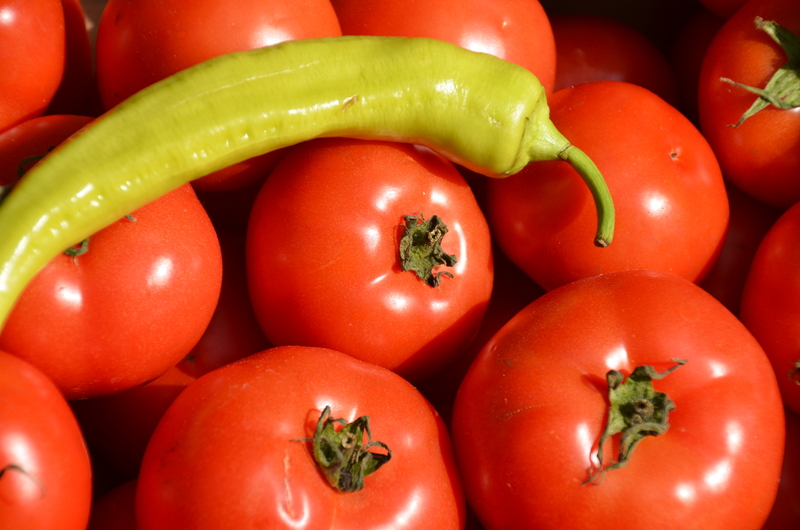 • Spending one very warm night in the hotel in Budva, Montenegro with no air conditioning, only to be given dinner the following evening as an apology. • Crossing the Montenegro border with 8 Austrian men on Harley Davidson and Indian motorcycles, passing them on the road several times and then learning they were staying at the same hotel and touring the same countries as we were. • Visiting King Nikola’s II Palace in Cetinje, Montenegro, and seeing it as he left it in 1918 to escape to Italy and France, where he died. 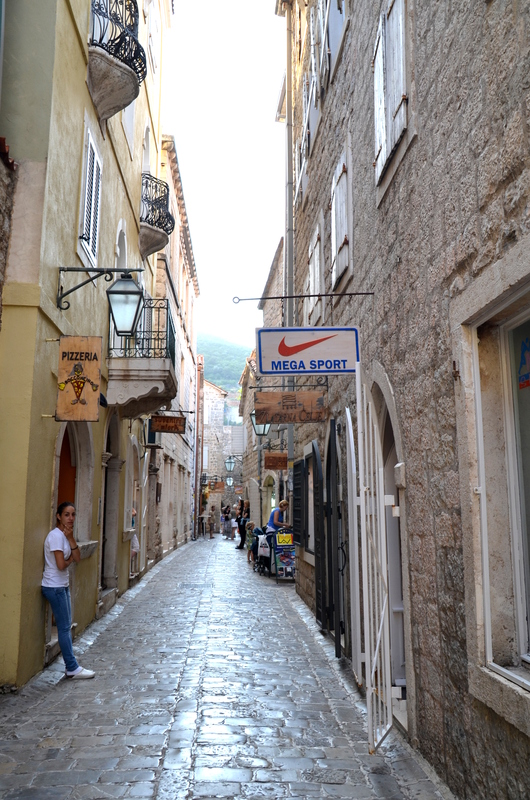 • Visiting another walled city in Kotor, Montenegro and having another gelato. • Walking on cobblestone streets through the walled cities that were so slick and smooth I could slip and slide, and fall not even once. Yeah! 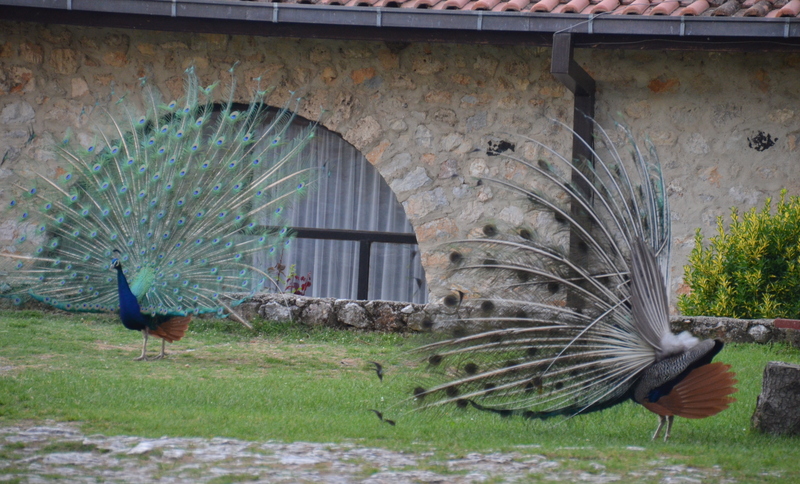 • Seeing 2 small islands in Perast, Montenegro, each with a monastery on them. Picture perfect. • Driving through Nuguse, Montenegro and seeing hams hanging in front of stores, only to learn Nuguse was known for their hams. • Sampling the famous Nuguse, Montenegro ham and wine. Enjoyable. • Crossing the fjord lake inn Budva, Montenegro on a car ferry. Fun. 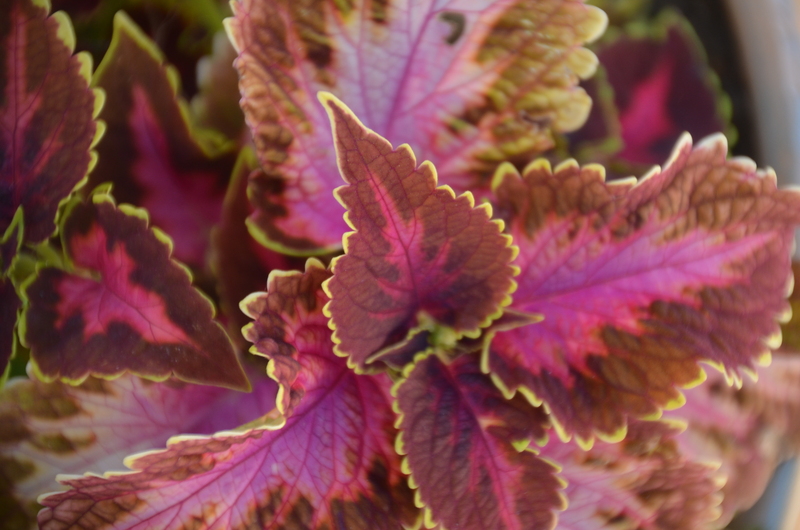 • Enjoying the multi-colored flowers all over the ex-Yugoslavia countries. • Learning that the civil war in the Ex-Yugoslavian countries was very costly and that the countries are still struggling as a result. • Visiting 5 Roman/Medieval walled cities in 4 days. Priceless. • Going 5 times in a matter of days to the Republic of Srpska. Awesome. • Learning that Mudjugorje, Bosnia-Herzegovina is like Fatima, Portugal and Lourdes, France where Catholics go to pray for a miracle. • Beginning the tour visiting monasteries and ending the tour visiting ancient walled cities. Priceless. 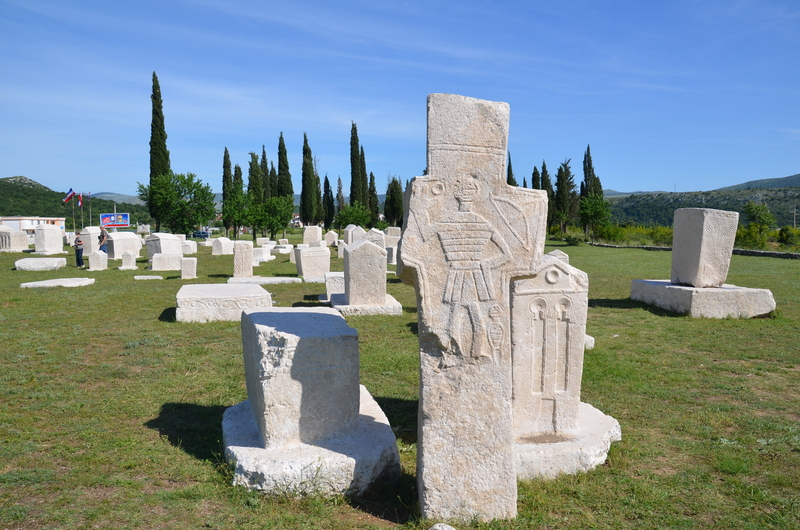 • Seeing the Christian sect, Bogomili, design-carved headstone necropolis on the side of the road in Stolac, Bosnia-Herzegovina, only to learn no bodies were buried with the headstones. • Crossing the arched bridge over the Neretva River, going from the Moslem to Serbian side, in Mostar, Bosnia-Herzegovina. • Learning the beautiful-arched bridge was destroyed during the civilian war and then re-built with the same stones. • Learning that religion, nationality and politics all come into play with the ex-Yugoslavia countries. • Seeing barbeque restaurants with large wooden wheels turning the meat covered spit over the fire on the way to Sarajevo, Bosnia-Herzegovina. • Staying in a 5-star hotel nice room in the center of Sarajevo, only to need to use a flashlight to see because the lights in the room produced very little light. • Seeing where WWI began, learning how and why it began, and photos/museum of it. • Shopping throughout the ex-Yugoslavia countries and Albania. • Seeing and learning where the civilian war started in the Holiday Inn in 1992 and lasting until 1994 in Sarajevo, Bosnia-Herzegovina. • Leaving Sarajevo for Slovenia and encountering a huge traffic jam because students were holding a demonstration protesting one of their students being killed by a car. • Seeing beautiful field after field of wheat, corn, oats, hay, all growing perfectly in sections, and seeing some fields with red poppies scattered throughout them in the ex-Yugoslavia countries and Albania. 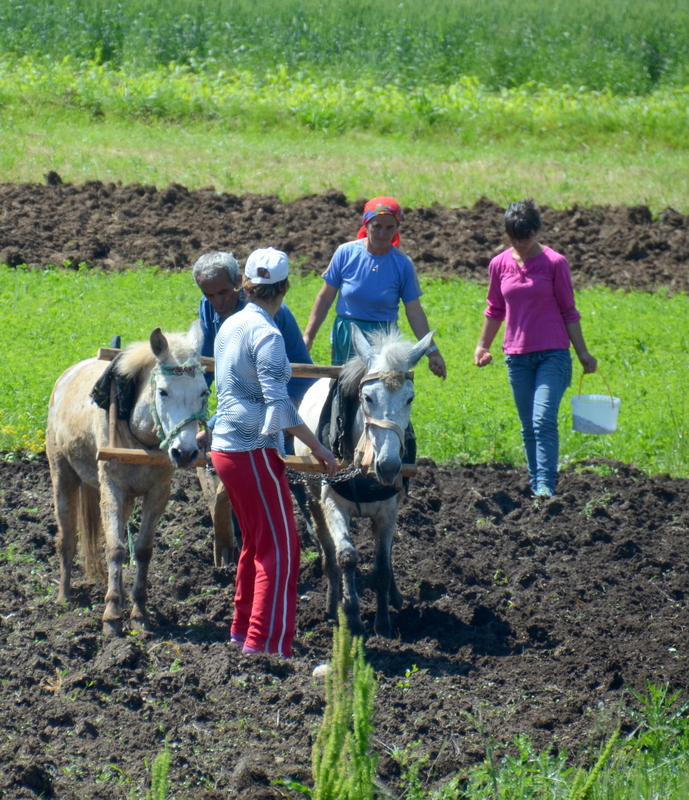 • Seeing fruit orchards and vegetable fields growing everywhere perfectly in the ex-Yugoslavia countries. 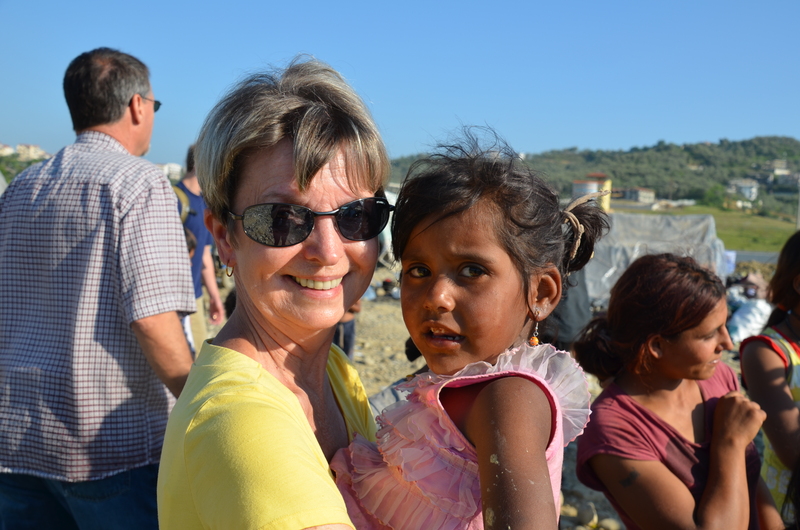 • Being totally surprised by Albania because all things we had read about it were not as we saw because it is changing and moving to the positive and vibrant with future plans. Beginning the trip on the Sava River in Belgrade, Serbia and ending the tour on the Sava River at Ljubljana, Slovenia . This couple was just dancing away as we strolled the classic city of Ljubljana, Slovenia. Bled, Slovenia has this castle just sitting on top of the cliff. The resort is so relaxing, fun and beautiful. The beautiful resort city of Bled, Slovenia has an lake for all kinds of recreation and this elegant swan was just swimming around watching all the activities. You’re really well traveled Carolyn, and have some beautiful stories! These countries are so picturesque. The people are deeply religious and so outgoing to tourists. May God bless them all in the daily struggles. It is apparent that this part of war-weary Europe love life and find it worth the hassles. Yay to gelato and wine!